Hour of Devastation may still feel fresh, but with just over a month from release, promotion for Ixalan is just already revving up. And while today should have only been the start of a geocaching-centric marketing campaign (first announced earlier this month), it seems Wizards of the Coast let just a bit more slip than planned. Just a couple weeks ago, Wizards of the Coast announced a partnership with Geocaching.com to offer Magic: the Gathering themed trackables as part of the promotion for Ixalan. If you’re somehow unfamiliar, geocaching is something of a game of hide and seek where—through the use of GPS or other methods—players attempt to locate caches hidden throughout the world. Sometimes this involves collecting a stamp hidden in the cache, or moving objects from one cache to another, ala Where’s George?. The upcoming Ixalan release is set in a world full of discovery, of players and characters exploring a world and searching for—well, something. We’ll get to that once previews are underway. But there is a way you can explore Ixalan by exploring our world. To sign up for a chance to win one of 1500 Ixalan trackables being given out globally or track one down in a cache near you, visit the official promotion page on Geocaching.com. Whatever you do, however, resist the urge to keep the trackable if you receive one; the core conceit of the promotion is that Wizards has promised to reveal more about Ixalan as the trackables travel further and further. Happy hunting! Maybe geocaching is not your thing? That’s totally fine, because we’ve received more information about Ixalan anyway. 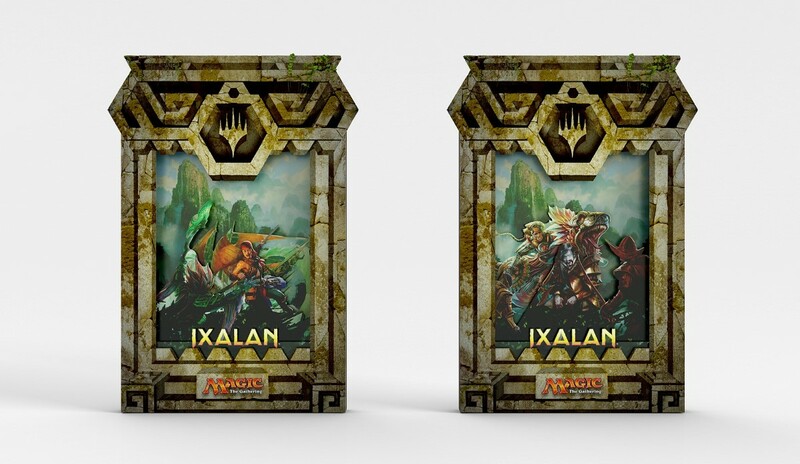 In what appears to be yet another web whoopsie, key Ixalan product images were briefly released on Wizards’ official product sites. 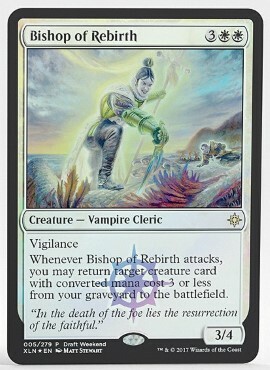 You may remember that the French-language Standard Showdown site gave us some our first glimpses at Hour of Devastation in a similar mixup back in June. 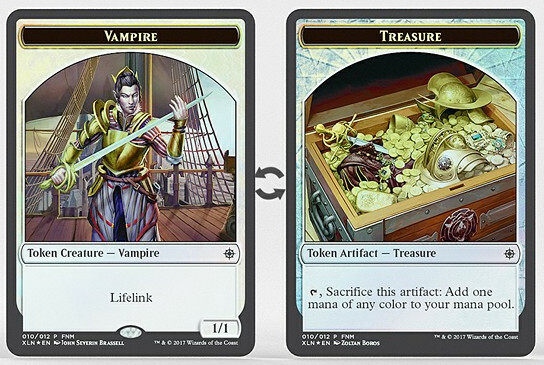 This time, we get to check out numerous product images, the Buy-a-Box, Draft Weekend, League and OpenHouse promotional cards for Ixalan, as well as the set’s double-sided foil tokens. 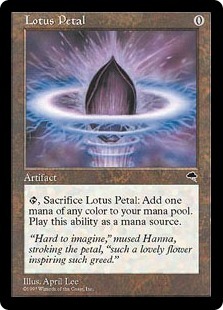 While the tokens may, sadly, be replacing FNM promos, they do tell us a few things. 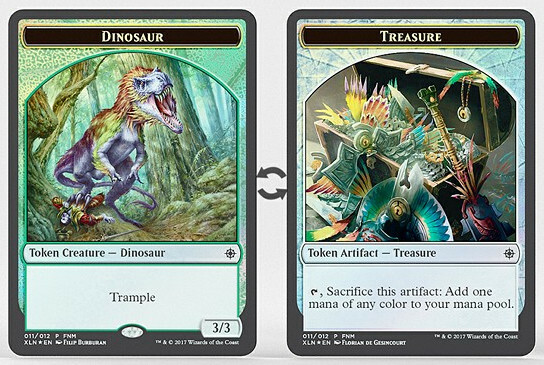 The first is that Treasure (Lotus Petal with the Treasure subtype) is clearly a major mechanic in Ixalan—at least to the degree that it justifies backing all three FNM promo tokens with a Treasure token variant. 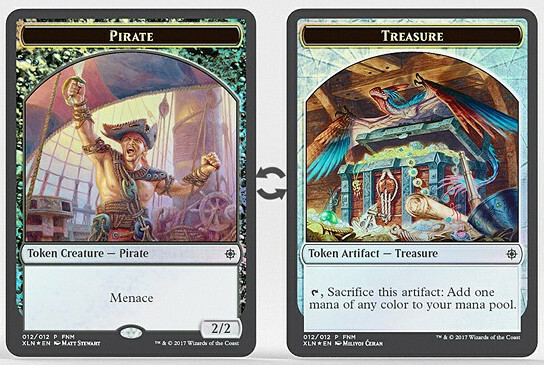 The second thing that stuck out to me is that the Pirate token does not have the Human subtype. This odd omission could mean a few things; specifically that either Pirates on Ixalan are not human, or that Pirates are just not strictly human. The former seems less likely, implying that Pirate is its own race. The latter, however, may indicate that multiple tribes of Ixalan will create Pirates, in which case Wizards has simplified things by having them generate 2/2 black Zombies, er… uh… Pirates. A non-tribal take on Pirates could be backed up by some excellent Christopher Moeller art on the OpenHouse promo for Walk the Plank. 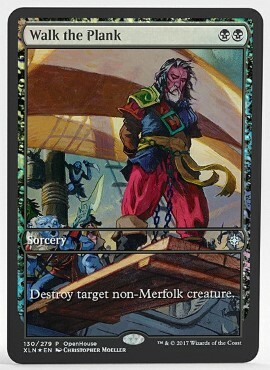 The full-art card, which features some of Moeller’s last artwork for Magic: the Gathering after the recent announcement of his retirement from the game, shows what appear to be both Human and what appear to be Goblin Pirates. One final tidbit to note is that product images displayed used Hour of Devastation full-art lands. While this could be meaningless, the nature of today’s accidental reveal would indicate to me that these are final product images. In that case, you would expect to see Ixalan full-art lands if we were going to get them. We will have to wait for more information to be released to find out for sure, however. Check out today’s reveals below, and stay tuned for whatever Wizards decides to reveal as the Geocaching promotion continues. 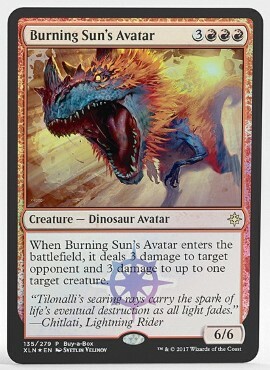 Whenever ~ attacks, you may return target creature card with converted mana cost 3 or less from your graveyard to the battlefield. When ~ enters the battlefield, it deals 3 damage to target opponent and 3 damage to up to one target creature.